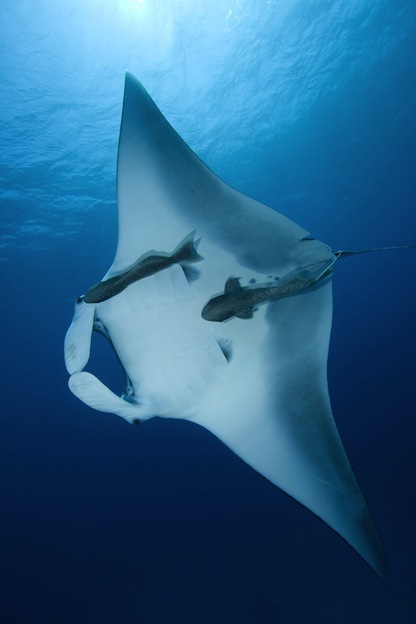 The reef manta ray is a cartilaginous fish big in size, but less big than the giant manta ray (Manta birostris). Until 2009 manta rays were encompassed in a single species, but based on several studies scientists realized that they were two different species. Morphology. The reef manta ray has a big body and two triangular-shaped pectoral fins that resemble the wings of a bird. So it is not surprising that people refer to mantas as “birds of the sea”. From the mouth structures called “cephalic lobes” extend, which are coiled when the animal is swimming. Its characteristic body is wide and long with a central “disk” and ends in a tail like a whip. Its mouth is rectangular. The upper body has a small dorsal fin while the lower area near the mouth holds the gills from which it gets oxygen from water. Its lower jaw contains several tiny teeth of 1 to 2 millimeters long. Weight and size. The females of this species show greater size than males, so there’s sexual dimorphism. The size of the “disk” of an individual can grow up to 5.5 meters wide but is usually twice as long as wide. The most common is for the “disk” to measure between 3 and 3.5 meters. Individuals reach a weight of up to 1.4 tons. Coloration. The most common color pattern is black or dark in the upper body and white on the bottom. The shoulders are usually interspersed with clear and round patches that vanish as they descend through the body. It has dark ventral spots and a clear tone at the tip of the pectoral fins. The mouth also has a white or gray tone. The species is found in the Indian, Pacific and Atlantic oceans in tropical and subtropical waters. However, their distribution is not uniform and it is itself fragmented. There have been a greater number of sightings in the Indian Ocean, especially from the Red Sea to South Africa in the west of the ocean and from Thailand to western Australia in the eastern Indian Ocean. In Pacific waters stretching from the Honshu island and Ryukyu Islands in Japan to the Lone Islands, French Polynesia and the Hawaiian islands. The sightings in the Atlantic Ocean have actually been very few and have been fewer to the north. Their habitats are often found near the coast and are found mainly near coral and rocky reefs and around atolls, bays, groups of islands and seamounts. The reef manta ray is a large animal, but feeds on tiny creatures called plankton. Specifically, zooplankton. Its teeth are useless when feeding as this species filter food through plates called gill rakers that are found in their ventral gills. When eating their cephalic lobes are unwound and extended to allow the entry of water into the mouth. Manta alfredi is distinguished by being a species that gather in groups when fed and able to travel along with other individuals. Sine parasites tend to adhere to their skin; it has a habit of visiting “cleaning stations” in coral reefs where small fish remove organisms from its skin. It is presumed that another way to eliminate parasites is jumping out of the water, although this may also serve as a form of communication or even game. Interestingly, some reef manta rays can do somersaults slowly when they feed. They perform seasonal migrations that cover hundreds of kilometers and daily migrations that extend to about 70km. In annual terms, an individual can travel between 270 and 500 kilometers. Experts suggest that females mature between 8 and 10 years old while males do so at an earlier age, about 6 years. Fertility is low considering that these animals are related to sharks, and females usually have one offspring and occasionally two. In breeding season the males chase the female to mate with it; courtship can last about 2 hours. Eventually, one of the male bites the tip of a female pectoral fin and transfers sperm through one of its claspers (claspers are male copulatory organs) for 15-35 seconds. Thus, fertilization is internal, and afterward the male definitely goes away from the female. Inside her eggs develop which are incubated right there for about 12 months until they hatch. Manta rays give birth to live offspring, usually at night. Their natural predators are large sharks, killer whales (Orcinus orca) and false killer whales. If attacked and wounded, their tissues regenerate quickly. Fishing in any of its forms is the greatest threat to their survival. Humans hunt manta rays to use their flesh as food and their liver to obtain oil and use it in local medicinal remedies. Their gill rakers and skin are also present in the market, and often they themselves are caught to be kept in captivity. It’s included on the Red List of the International Union for Conservation of Nature as “vulnerable” species. In the United States, the Philippines, Maldives and Western Australia there are laws and natural areas that protect its life and even prohibit its fishing. However, conservation efforts don’t have an extensive scope as in the case of other species.